The service is available with most of our suppliers ON REQUEST! Numerous travelers plan trips from Canada to US (or USA to Canada) every year in a rental car. That way, they are able to enjoy the spectacles that the drive offers to the fullest in total freedom. So, if you are planning to rent a car from Canada to USA (or vice versa), you are at the right place! Dense network of major city and airport locations in Canada as well as USA – you can request any location as your pickup/drop-off. Our partners allow the renters to take their hired cars across the border from Canada to USA & vice versa. And international one-way is available on request, you can call us and we will confirm it with the supplier. We will help you find your preferred car at the price that suits you. What do I need to rent a car for one-way from Canada to USA? A valid credit card: you need to bring it even if you have paid the whole rental amount at the time of online booking. Kindly bring the original documents; the suppliers usually don’t accept the digital or Xerox copies. 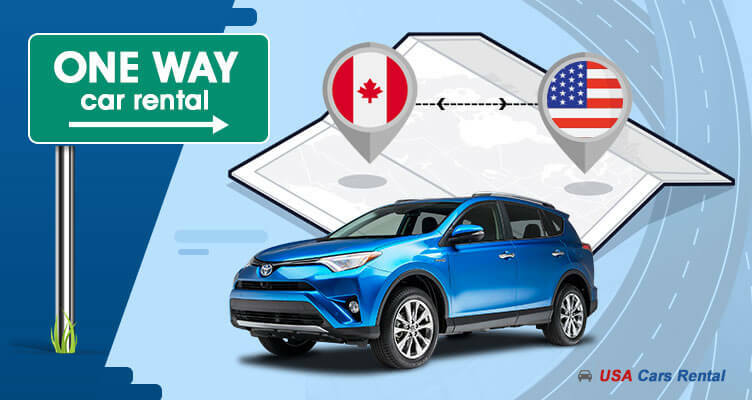 How to rent a cheap one-way car rental from Canada to USA? Visit Canada is in the months of fall season – in the months of September & October, while for camping it is July & August. In these months the rental prices are really cheap and you will be able to save a considerable amount of your vacation money, if you choose to rent in these months. If you want a one-way, different car hire companies provide different rental one-way rates. Go for the rental which comes with unlimited mileage, standard insurance & a low basic rental price. In case you have a return flight from Canada, book a round trip rental & save the one-way fee. For cross country rentals, the suppliers don’t provide a comprehensive fleet for last minute rentals. Though 12 and 15 passengers van rentals, SUVs, convertibles and economy cars are available, we advise you book way in advance to get hold of a greater variety and cheaper rates. If you are a Canadian resident taking your rental car into USA, the border officer will ask for your passport and identification. If you are an international traveler you will need a visa to do so plus pay the fee to enter the US. Keep all the car rental documents handy from car’s registration to insurance documents plus your identity proof. Fines: Keep a track of the speed limit and make sure that you don’t get a ticket while you are driving in the US. Fines and legal fees are not the responsibility of the rental company, nor are the tolls. Still check with the representative at the time of pickup, some suppliers provide toll electronic tags. Call to confirm the one-way: Before renting the car deal online, call the supplier and let them know that you are intending to take the vehicle to USA. They take the bookings and confirm it on the basis of rules prevailing at the time of booking. Or, give us the pickup and drop off locations & the car-type you need over the phone and we will present you with the available options. In case you have a problem, you can always reach us through phone, live chat & WhatsApp.